For a long time i have been asked if i could make pins out of my Steampunk sculptures , it was an excellent idea , it reminded me of all the beautiful insect shaped accessories and Jewellery that were made during the Victorian era . So i've decided to start making them , So far i have made only 4 . 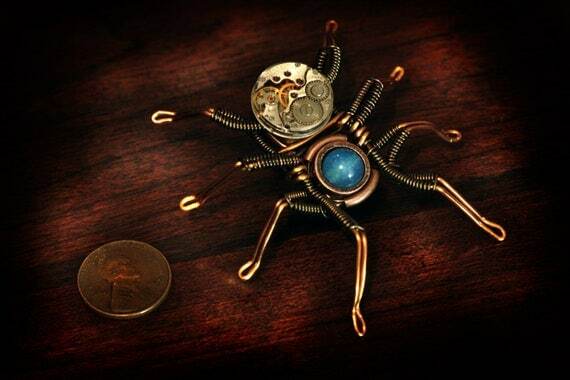 #4 and the last one which i'm giving away : Steampunk Spider Lapel pin Sculpture , Purple with skull and Antique Watch movement . I will announce the winner here on the 8th of october ( Columbus Day ) . And the Winner is Sandrine ! Thanks to all who participated and stay tune for more , I will make several spiders with your suggestions in the following weeks . Well my favorite colors are lilac and ruby, I love them together as well. I would LOVE to see a gorgeous Black Widow inspired pin. Maybe black and silver wire with a ruby, or a wire wrapped hourglass. I feel like it would be so stunning and beautiful <3 thank you SOOO much for the chance to win one of your pieces! My favourite colours are forest green and cobalt blue. 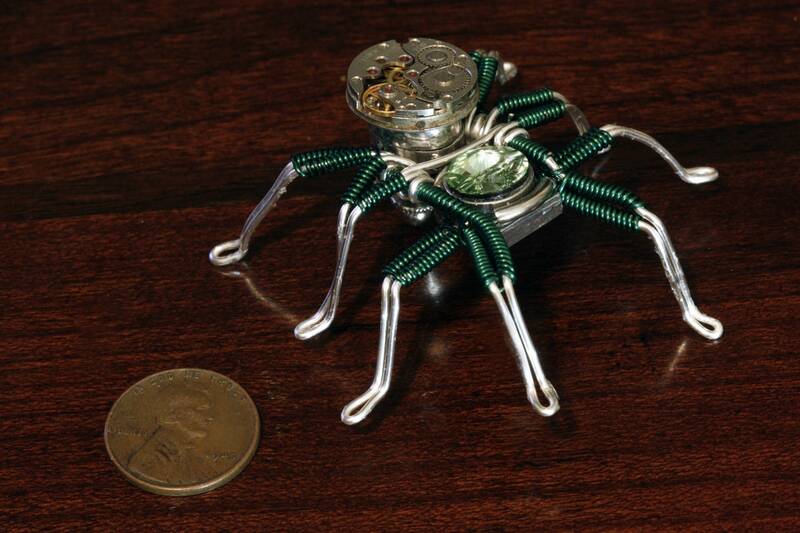 It would be amazing if you made a mini-version of your leaf spider, that is absolutely fantastic. I love purple and green and spiders are my icon. My favorite items that you create have to be spiders, each and every one but the thought of having one to wear as a pin is amazing. My favorite colors are dark purple and black. I would love to see a spider made of an antique key, or perhaps one with the black widow symbol on it. These are so beautiful. I love all of these spider pins. My favorite is the red one. I also like the green one. I would like to see one made with black wire and red crystals. My favorite colors are smoky blue & white. I love the green. They are all wonderful, but the green is my fav. In general I like black, white, green, purple and brown. I also like the Idea of Mother of Pearl or black and white pearls. I would like to see a Pacific Northwest wolf spider, like the ones I find in my house. They are big, brown furry guys. I think they are pretty cool and have beautiful fall coloring. They are also poisonous, but they have left me alone. Good spider friends. I'd love to see a black widow--onyx head and red stone on the abdomen. Lovely sculptures! I agree a mini leaf-spring spider would be phenomenal, but for new idea I would love to see a rendition of a jumping spider, they are so inquisitive; or perhaps a black widow themeo with a black/red cameo as the body with tiny swarovski crystals as eyes? Tangible beauty as always!!! I love the colors you have now... And to comply with your request for the post, maybe a darker green and gunmetal, with and an emerald colored crystal. I also love the purple one for the giveaway; I would buy one of those. love the Blue Stone one, these are really great! Thank you! I know its not too unique, but I love pale iced pink. I am really fascinated by the Bird Eating Spider of South America. It would make such a cool pin! I'd love to see something turquoise and gold - something that has a Mediterranean feel to it, perhaps something you'd expect to find in a market in Marrakesh. they look great... my favourite colours are red and purple or black - or any combination of them. I would LOVE to see a Dragonfly Czech Glass one! I love the bracelet (but I broke my wrist and can't wear them...) Or a Black Widow with a Red Taxidermy Eye! Love the red one! It would look great with some of my Steampunk clothing. Would love to see other themed spiders (black widow, and such) or even a spider or squid wired ring. My favorite colors are green and red, not normally together. I would love to see you do something with the leaf spider or more of the articulated legs. That red one will look perfect on my winter coat. I love the antique button. My favorite color is royal purple, and I usually like to see it combined with a nice forest green or bright yellow. As for your spiders, I think I'd like to see a "poison ring" style spider, with an abdomen that opens up to hide small treasures within. My favourite colour is the purple one. I'd really love to see more pins in the future, and more animal shaped one, perhaps some owls, or octopus? ;) You should also keep on doing the precious stone color scheme, I like it! I thought I had some good ideas, but there is a wealth of awesome suggestions already posted. My personal favorite colors are deep blue and dark green, especially with patina copper. Any of the above suggestions would just be awesome. My personal favorite colors are deep blue and forest green, especially against a nice copper patina. Maybe royal blue and leaf green, some kind of forest spirit inspired spider? I also love green and purple. Love the green one on here...maybe with more brass colorings. Everyone has such great new ideas already. I like the idea of the hourglass shape for black widows. I've just fallen in love with your work. Amazing! My favorite color is deep, dark green. I think a white spider pin would look amazing against my black/grey cloak. I like the blue agate spider. The blue looks misty. My favourite one is the blue spider, somehow she looks more gentle than the others! I would love to see a tiny mechanical peacock spider, maybe with a round piece of copper etched with colours, they're so lovely and colourful! You could eve play with the peacock part and use a small peacock feather on her. I like #3 - the golden colors are really nice. It would be cool to have something with wings, like a bee or a dragonfly. How about one inspired by Austracantha minax - they look ferocious but are rather sweet. I love green, maybe associated with the same leg colors than the blue one? Suggestion for the next spider pins... hum... you could try a shape somehow different, more inspired from orb weavers. I like the look of the Nephila species, as well as the Micrathena ones. I'm sure you'd find Micrathena inspiring, give it a look! They are all beautiful and shinny, what more could a girl want? Personal choice, I prefer metals over colours. They would look oh so nice co-ordinated with hat pins of the same design [smaller?] or cravat tacks. Posted your contest to my own and business FB page. my gosh, all of them are completely awesome, but my heart belongs to blue one! I love the one with the blue stone! you had it labeled "blue dragon veins agate and antique watch movement". A black or gold one would be really cool to see from you I think. Thanks for hosting this contest! i have a huge thing for the purple one!!!! I would love to see one similar to the top, but with a darker green for the legs. Use some form of spike or half-cog to accent joints, a head with many small eyes like a real spider, and a more rounded abdomen using a taxidermy eye that matches the legs. You have a wonderful talent. I love your artistic pieces. My favorite colors would be cobalt blue and deep red. My idea would be for a bird shape. Maybe a large black crow or a beautiful hummingbird. Purple is my favorite color so I'd have to say purple. They look really awesome!! I love the blue and the ruby, they are so pretty. Maybe a black widow inspired one, maybe red black and silver. Or maybe even a key with thorns wrapped around it. Red and black to match the cameos you sent me!! Love them! Love your work!! My friend Amy LOVES spiders and I could see her with a red and black spider lapel pin. She portrays a pirate at our home renaissance faire and she looks lovely in red and black. Amazing work! Keep it up. LOVE your work! 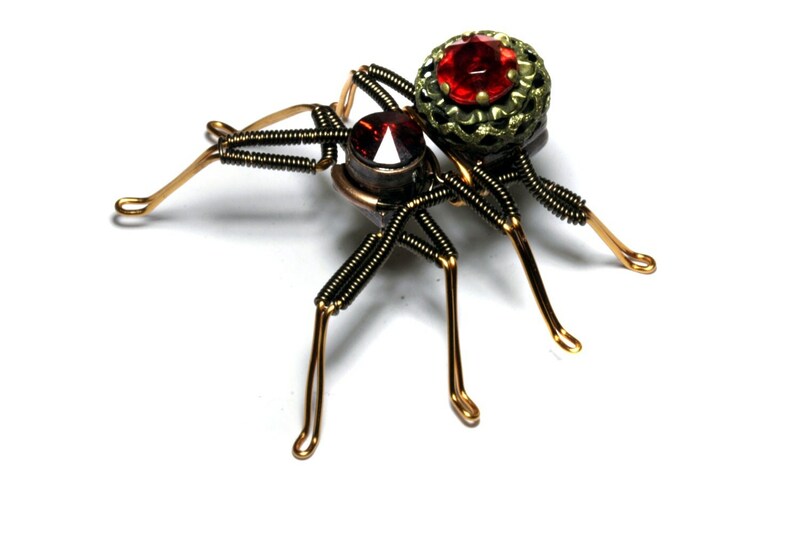 A friend of mine, Amy, collects spider jewelry and I know she would just be thrilled with a red and black steampunk spider lapel pin. Keep up the awesome work. My favorite colors are purple and crimson. I especially like the little eyes you add to your rings and spiders. Your dnd inspired creatures are also awesome, think you could do an owlbear? I would love to see them in black, emerald green and ambar. They're gorgeous!